Gus Poyet has backed Tim Sherwood to sort things out for the Queens Park Rangers. 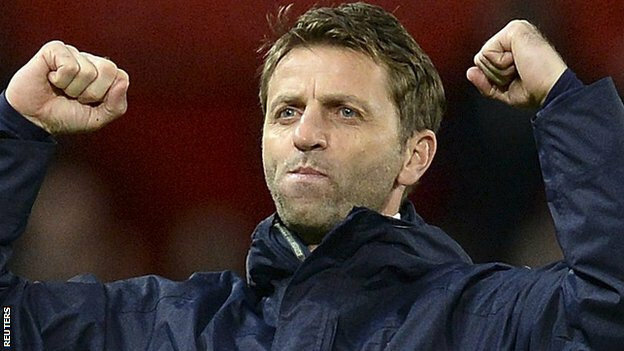 Sherwood is the frontrunner for the manager’s post at QPR after the resignation of Redknapp. Poyet and Sherwood have been teammates in the past as the duo played together for the Spurs. Sherwood worked as manager at White Hart Lane during the second half of the 2013-14 Season and that’s the only managerial experience that he has had. He has not managed any other club. For the entire last summer, he was jobless. And, now, all of a sudden, he seems to be going to get a very tough assignment. The Rangers are sinking fast in the league. They are the holder of the penultimate position in the table with 19 points. They have actually won more games than the likes of Burney and Hull City, but, because of the fact that they have lost a lot too and by big margins, their goal differential is down. A few draws here and there and the Rangers would have found themselves in a safe position by now. However, the time is still there for QPR, with their odds odd staying up to that of a the red/black conumdrum on a roulette table, but, there are some top teams that they will have to contend with in the coming weeks. According to Poyet, Sherwood has got a good tactical brain and if he is appointed at Loftus Road, he would do a fine job.